The ICC registrar is responsible for managing the detention centre. The rules governing detainment are contained in Chapter 6 of the Regulations of the Court and Chapter 5 of the Regulations of the Registry. The International Committee of the Red Cross (ICRC) has unrestricted access to the detention centre. Each individual has his own toilet and washing area. Each has access to a small gym and is offered training with a physical education instructor. Detainees are provided with meals, but they may also cook for themselves, purchase food from the prison shop, and have ingredients ordered in. However, Charles Taylor's lawyers have complained that "the food which is served is completely eurocentric and not palatable to the African palate". Detainees are allowed to communicate in private with their defence teams and diplomatic representatives of their countries of origin. They are permitted visits from family members, spouses and partners, and spiritual advisors. The following table lists all the people who have been held at the ICC detention centre since it was established in 2006. The first person ever detained by the court was Thomas Lubanga, who arrived at the detention centre on March 17, 2006. Three former prisoners have been released or transferred, including Charles Taylor, who was tried in the Special Court for Sierra Leone. His trial was held at the ICC's facilities in The Hague because of political and security concerns about holding the trial in Freetown. ^ United Nations Department of Public Information (December 2002). The International Criminal Court. Retrieved on July 7, 2008. ^ a b c d e f g h International Criminal Court (2007). "ICC Detention Centre" (PDF). . Retrieved on July 7, 2008. ^ a b Emma Thomasson (February 28, 2006). ICC says cells ready for Uganda war crimes suspects. Reuters. Retrieved on July 7, 2008. ^ a b International Criminal Court (May 26, 2004). "Regulations of the Court" (PDF). Archived from the original (PDF) on 2007-09-27. , Chapter 6. Retrieved on July 7, 2008. ^ International Criminal Court (September 25, 2006). "Regulations of the Registry" (PDF). Archived from the original (PDF) on 2007-10-29. , Chapter 5. Retrieved on July 7, 2008. ^ International Criminal Court (March 29, 2006). "Agreement between the International Criminal Court and the International Committee of the Red Cross on Visits to Persons deprived of Liberty Pursuant to the Jurisdiction of the International Criminal Court" (PDF). Archived from the original (PDF) on 2007-10-29. , Article 4. Retrieved on July 7, 2008. ^ a b c International Criminal Court (April 2006). FAQ about detention put to Terry Jackson, Chief Custody Officer of the ICC Archived 2007-10-10 at the Wayback Machine. ICC Newsletter No. 7. Retrieved on July 7, 2008. ^ a b c Alexandra Hudson (May 31, 2007). 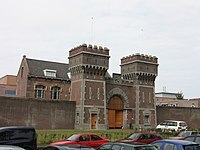 Warlord Taylor's home is lonely Dutch prison. Reuters. Retrieved on July 7, 2008. ^ International Criminal Court (March 17, 2006). First arrest for the International Criminal Court. Retrieved on July 7, 2008. ^ BBC News (June 20, 2006). Q&A: Trying Charles Taylor. Retrieved on July 7, 2008. ^ "The Prosecutor v. Thomas Lubanga Dyilo (ICC-01/04-01/06)". ICC. Retrieved 2013-12-04. ^ "Charles Taylor Transferred to the UK for the Enforcement of his Sentence" (PDF). SCSL. 2013-10-15. Retrieved 2013-12-04. ^ "ICC - The Special Court for Sierra Leone to use ICC Facilities for Trial of Charles Taylor". ICC. 2006-06-21. Retrieved 2013-12-04. ^ "Germain Katanga found guilty of four counts of war crimes and one count of crime against humanity committed in Ituri, DRC". ICC. 2014-03-07. Retrieved 2014-03-07. ^ "The Prosecutor v. Mathieu Ngudjolo Chui (ICC-01/04-02/12)". ICC. Retrieved 2013-12-04. ^ "The Prosecutor v. Jean-Pierre Bemba Gombo (ICC-01/05-01/08)". ICC. Retrieved 2013-12-04. ^ "The Prosecutor v. Callixte Mbarushimana (ICC-01/04-01/10)". ICC. Retrieved 2013-12-04. ^ "The Prosecutor v. Laurent Gbagbo (ICC-02/11-01/11)". ICC. Retrieved 2013-12-04. ^ "The Prosecutor v. Bosco Ntaganda (ICC-01/04-02/06)". ICC. Retrieved 2013-12-04. ^ a b c "The Prosecutor v. Jean-Pierre Bemba Gombo, Aimé Kilolo Musamba, Jean-Jacques Mangenda Kabongo, Fidèle Babala Wandu and Narcisse Arido (ICC-01/09-01/13)". ICC. Retrieved 2013-12-04. ^ "ICC-CPI-20140318-MA154: Initial appearance of Narcisse Arido scheduled for 20 March 2014". ICC. 2014-03-18. Retrieved 2014-03-18. ^ "ICC-CPI-20140322-PR988: Charles Blé Goudé transferred to the ICC". ICC. 2014-03-22. Retrieved 2014-03-22. ^ Situation in the Republic of Mali: The Prosecutor v. Ahmad Al Faqi Al Mahdi Archived 2016-08-03 at the Wayback Machine (last updated August 24, 2016). ^ Ahmad al-Faqi al-Mahdi: The vandal of Timbuktu, BBC News (September 27, 2016). ^ "ICC-CPI-20180331-PR1376: Al Hassan Ag Abdoul Aziz Ag Mohamed Ag Mahmoud surrendered to the ICC on charges of crimes against humanity and war crimes in Timbuktu". ICC. 2018-03-31. Retrieved 2018-03-31. ^ "Ex-Bosnian Serb wartime leader Karadzic given life in prison". Reuters. 2019-03-20. Retrieved 2019-03-20.